The Grand facade of Britannia's Royal Albion Hotel in Brighton is a magnificent example of the stunning Regency style architecture seen throughout the heart of Brighton. Built in 1862, it still holds much of its original charm, and is the perfect place to book Brighton accommodation. Our Brighton Hotel is located directly on the seafront, with stunning views and easy access to all that Brighton has to offer. Just a stone’s throw from Brighton's Sea Life Aquarium (The oldest operational aquarium and the UK's Largest underwater viewing tunnel), it is also less than a minute’s walk to the amusements and rides on Brighton Pier. 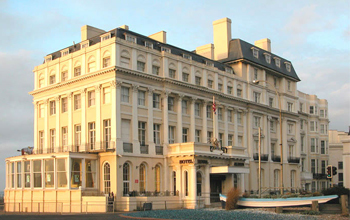 Britannia Hotels offers some great deals at our Hotels in Brighton, so guests should take care to book direct with us for the lowest rates and maximum availability on short stay breaks, bed and breakfast and family holidays at this popular UK tourist destination.